MONTREAL, Feb. 14, 2019 (GLOBE NEWSWIRE) -- Sama Resources Inc. (“Sama” or the “Company”) (TSX-V: SME | OTC.PK: SAMMF) is pleased to announce that the mineralized interval from the first deep hole, YE29-556043 (ref: press release of December 12, 2018) returned results, with a combined 5.2 meter (“m”) of semi-massive sulfides grading 1.16% nickel, 0.62% copper, 0.24 grams per ton (‘gpt”) palladium and 0.21 gpt platinum (using a cut-off-grade of 0.8% nickel) within a larger interval of 37 m of disseminated sulphide mineralisation grading 0.41% nickel, 0.31% copper, 0.23 gpt palladium and 0.17 gpt platinum. The image below shows that the hole hit the upper edge of the Typhoon™ electromagnetic geophysical survey (“Typhoon™”) target, leaving the remaining bottom two-thirds and the center untested. “We are very pleased with the accuracy and results using the Typhoon system. On the very first drillhole and the very first Typhoon loop; the platinum values using the deep drilling are quite surprising as the palladium is typical of the mineralization seen at Samapleu but the platinum is significantly more elevated and constant than at Samapleu. We look forward to pinpointing new zones using Typhoon as we continue our deep drilling program at Yepleu,” Stated President & CEO Dr. Marc-Antoine Audet. The current 6,000-m drilling program designed to test high-conductivity targets defined by the Phase 1 Typhoon™ continued at the 100%-owned Yepleu property at the Company’s Nickel-Copper-Cobalt-Palladium Project in Côte d’Ivoire, West Africa. The drilling program is targeting semi-massive and massive polymetallic sulphide anomalies identified by Typhoon™ at depths ranging from 600 m - 900 m from surface. The mineralization encountered in the hole is characterised by aggregates of the nickel, copper and iron sulphides pentlandite, chalcopyrite and pyrrhotite, respectively. Pentlandite occurs together with pyrrhotite, while the chalcopyrite is either mixed with the pentlandite and pyrrhotite or occurs as late millimetric to centimetric sulphide veins cross-cutting the pentlandite and pyrrhotite. Contacts between the semi-massive sulphides and the mineralized pyroxenite and gabbroic host rocks are irregular but sharp and often show brecciated textures. This indicates that these sulphide lenses have intruded the host rocks and originated from a source that is yet to be discovered. The Phase 2 Typhoon™ survey will start in February in additional sectors at the Yepleu and Grata properties based on results from the 2,889-line/kilometer (“km”) airborne helicopter time-domain electromagnetic and magnetic survey (“HTEM Survey”) completed in 2018. Sama selected the Yepleu and Grata areas for this second phase of HPX’s Typhoon™ survey due to the high quality HTEM responses as well as the prospective geological setting. The Yepleu and Grata prospects are located 25 km apart. 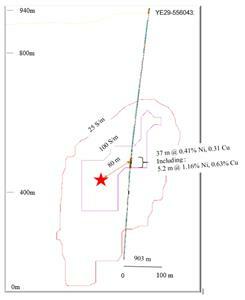 The Yepleu mineralization is similar to conduit‐hosted nickel deposits found elsewhere. These rare types of intrusions host the world’s largest nickel‐copper deposits such as Jinchuan (515 million tonnes (“Mt”) at 1.06% nickel), Voisey’s Bay (137Mt at 1.68% nickel), Kabanga (52Mt at 2.65% nickel), Eagle (4.5Mt at 3.33% nickel), Eagle’s Nest (20Mt at 1.68% nickel), Kalatongke (24Mt at 0.68% nickel), and N’komati (2.8Mt at 2.08% nickel). Sama discovered the nickel-copper-cobalt-palladium mineralization when it discovered the Yacouba layered complex of mafic and ultramafic rock. This layered complex was created approximately 2.1 billion years ago by the intrusion of magma through the Man Shield. The Yacouba complex can be traced over a strike length of more than 50 km within Sama’s properties in Côte d’Ivoire. Core logging and sampling was performed at Sama’s facility at the Yepleu field facility. Sample preparation was conducted at the Bureau Veritas Mineral Laboratory’s facility in Abidjan. Sample pulps were delivered to Activation Laboratories Ltd, Ancaster, Thunder Bay, Canada, for assaying. All samples were assayed for Ni, Cu, Co, Pt, Pd, Au, Fe and S.
The Company is also pleased to report that certain officers, directors, advisors and employees of the Company have elected to exercise 740,000 stock options which were set to expire on January 21, 2019. The stock options were exercised at a price of $0.23 per optioned share with gross proceeds received by the Company of $170,200. The Company also reports that 1,000,000 non-transferable common share purchase warrants of Sama have been exercised prior to the scheduled expiry date of July 29, 2021. The warrants were exercised at a price of $0.15 per warrant share for total proceeds of $150,000 (for a combined total of $320,200). HPX is a privately-owned, metals-focused exploration company deploying proprietary in-house geophysical technologies to rapidly evaluate buried geophysical targets. The HPX technology cluster comprises geological and geophysical systems for targeting, modelling, survey optimization, acquisition, processing and interpretation. HPX has a highly experienced board and management team led by Chief Executive Officer Robert Friedland; President Eric Finlayson, a former head of exploration at Rio Tinto; and board member Ian Cockerill, a former Chief Executive Officer of Gold Fields Ltd. For further information, please visit www.hpxploration.com. Sama is a Canadian-based mineral exploration and development company with projects in West Africa. On October 23, 2017, Sama announced that it had entered into a binding term sheet in view of forming a strategic partnership with HPX TechCo Inc., a private mineral exploration company in which mining entrepreneur Robert Friedland is a significant stakeholder, in order to develop its Côte d’Ivoire Nickel-Copper and Cobalt project in Côte d’Ivoire, West-Africa. For more information about Sama, please visit Sama’s website at http://www.samaresources.com. The technical information in this release has been reviewed and approved by Dr. Marc-Antoine Audet, P.Geo and President and CEO of Sama, and a ‘qualified person’, as defined by National Instrument 43-101 Standards of Disclosure for Mineral Projects.